Many people arrive here seeking more Chinese fonts for their Ubuntu systems, so I've bumped this paragraph up to the top. I do periodic surveys of what's out there. See my page listing the BabelStone Han project and other sources for free and commercial Chinese fonts. 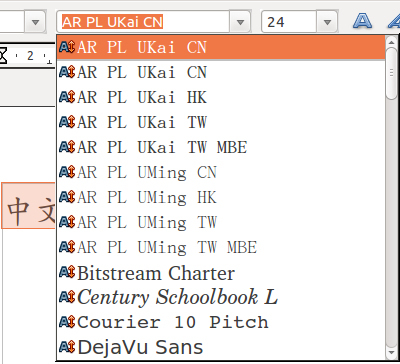 After you have completed the Chinese features installation for Ubuntu 10 / Ubuntu 11 / Ubuntu 12 - 17 / Ubuntu 18 you'll find the following Chinese fonts on your font menus. 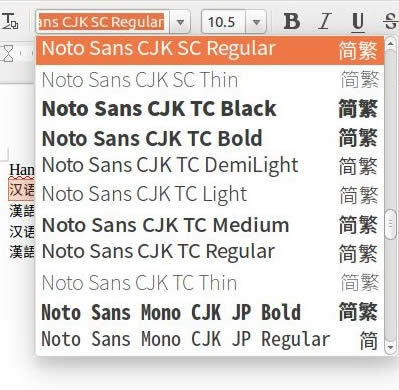 Ubuntu 16 and later include the Hei (san serif) style "Noto Sans CJK" Unicode font. As of April 2017 you can also download the Song (Ming, serif) "Noto Serif CJK" font until it is simply included in a future release. See my free Chinese fonts page for more info. These are the Google-branded versions of the open source Unicode "Adobe Source Han Sans" and "Adobe Source Han Serif" fonts, and offer the maximum number of characters possible in a Unicode font. For more background information on this first ever open source Pan-CJK font, see my article on these fonts. 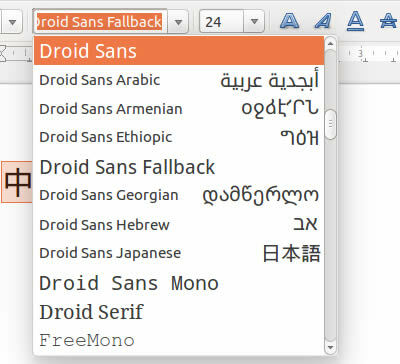 In Ubuntu 15 the Hei (san serif) style was represented by Droid Sans and Droid Sans Fallback. Fallback was the default Chinese font. It is still in most subsequent releases, but is no longer the default. WenQuanYi Hei fonts are hiding at the bottom of the same menu in Ubuntu 10-14.10, and can also be downloaded for free from the WenQuanYi website. 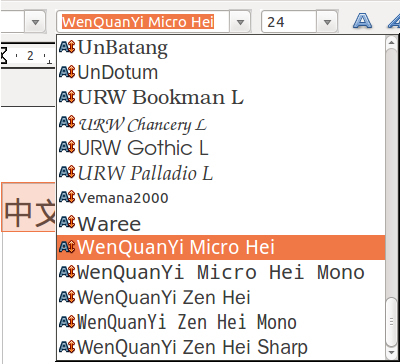 Ubuntu 11.04-13.04 included even more WenQuanYi Chinese fonts, with 文泉驛 Chinese names! I'm not sure what happened to these since 13.10, but as I said you can always visit the WenQuanYi website for more. Fonts names ending in "CN" contain mainland character sets, while fonts with names ending in "TW" and "HK" are in Taiwan sets. Font names ending in "MBE" include the Modern Bopomofo Extensions used in the teaching of Hakka and Minnan dialects instead of the Standard Bopomofo Extensions. The fonts with names ending in "Mono" include Latin characters "monospaced", with equal widths between each letter, instead of proportional spacing. I assume the HK font includes the latest extensions to the Hong Kong Character Set (HKCS). For that font most will still need a Cantonese input method. You can download and install Cantonese via Synaptic (search for fcitx-table-cantonese or ibus-table-cantonese, fcitx-table-jyutping or ibus-table-jyutping, or scim-tables-zh), or you can use CantoInput which is a free Java app I have reviewed in my survey of third-party apps. Phonetic Guide (Format > Asian phonetic guide) will let you place Zhuyin or Pinyin pronunciation "ruby" text above or alongside your Chinese characters. You can select text in your document and it will appear in the Phonetic Guide, but LibreOffice & OpenOffice require you to type in those rubies by hand. To automatically generate Pinyin ruby text you may want to try an open-source extension for OOo called OO Pinyin Guide. If that doesn't work well enough for you, my free Pinyin macros for OpenOffice and LibreOffice will help you type Pinyin with tone marks youself, and there are many free online annotation tools like the one offered by Mandarin Spot . 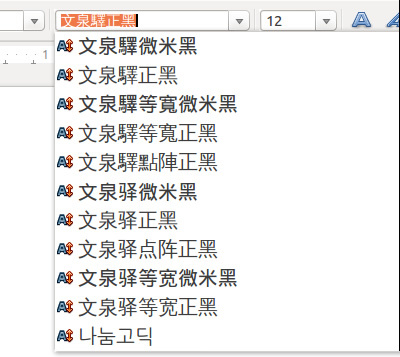 Those still using IBus may want to also try the ibus-m17n package Pinyin-with-tone-marks input method.